A general information video on glaucoma using diagrams of eye structure. The Ritch-Sussman Technique:Instilling eyedrops, including spacing and occlusion. 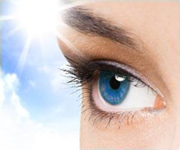 Increase the amount of medication that enters the eye by 50%. Increase the duration of action by 50%. Reduce absorption into the body, to reduce side effects. 2009: Dr. Robert Ritch says that while this is not a perfect video, "I don’t know of a better video on tonometry." corneal thickness expressed in mmHg rather than micrometers, as Dr. Ritch pointed out. Although cornea edema is mentioned, there is insufficient mention of cornea biomechanics as a source of error in Goldmann applanation tonometry. The assumptions in the Modified Imbert Ficks law are ignored. For example, the assumption that surface tension and force to bend corneal cancel each other out, is presented without qualification. The explanation of how non-contact tonometers compute intraocular pressure is incomplete (and possibly incorrect). Propagation of the unsupported idea that Goldmann tonometry is the "most accurate" method in spite of recent advancements such as the Pascal Dynamic Contour Tonometer and the Reichert Ocular Response Analyzer. It is understandable that a short video cannot go into every detail, but I would have liked to see a slightly less dogmatic presentation of the same material. Above: New Concepts in Our Understanding of Glaucoma: How dynamic pulsatile mechanisms determine aqueous outflow.